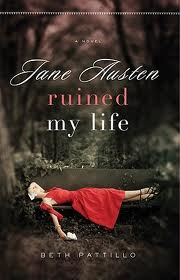 I quite enjoyed Jane Austen Ruined My Life by Beth Pattillo, but I have a major complaint to make about the physical book. The cover was really stiff, with sharpish edges and some of the pages fell out as I was reading. It was really irritating, because the story deserved better. Emma, the heroine of this novel, is an American college professor who has recently learned of a number of unpublished letters by Jane Austen. Can you imagine if this really happened? The Jane Austen letters in existence are the dullest correspondence of all time and the thought of seeing what Jane Austen was really capable of, uncensored by her sister, would blow the upcoming, formerly lost Harper Lee book out of the water. Emma’s marriage ended after she learned in the worst possible way that her husband had been having an affair with her assistant (use your imagination here). To make matters worse, her rat husband and assistant framed Emma for plagiarism, causing her to be denied tenure at her school. Emma flees to her cousin’s house in London, where she is surprised to learn that her former best friend Adam is also staying. Emma and Adam’s friendship ended when Emma married, due to Adam’s disapproval of her choice of husband. Emma is in London to investigate the claim of a Mrs Parrot, who claims that she has a number of unpublished letters written by Jane Austen. On examination, the first letter Mrs Parrot allows Emma to see appears to be authentic and opens up more questions about Jane Austen than it answers. Mrs Parrot tells Emma that she is a member of a group known as the Formidables, originally headed by Jane Austen’s sister Cassandra, who existed to protect the letters and by extension, Jane Austen’s privacy. Emma is set a number of tasks by Mrs Parrot before she is allowed to see subsequent letters and as she undertakes the tasks, she learns more about herself. Her emotions are complicated by Adam’s presence and their potential romance. Emma’s story ends happily, with her personal affairs being resolved to a point where her reputation is restored and her hurt and anger with her former husband becoming her past, rather than her present. Emma defers her ‘happily ever after,’ but I can live with that, because for me, the ‘Emma’ part of this story was okay, but the Jane Austen parts of the story were thrilling. I really enjoyed the descriptions of Emma’s visits to Steventon, Bath, Chawton, Lyne Regis and other places that Jane Austen either lived in or visited. The possibility of Jane Austen having events in her life which were forever hidden after her death by Cassandra Austen’s censorship of her sister’s correspondence is fascinating. The author clearly explains that this story line is pure fiction, but I still found the possibility of these events to be enormously tantalising. Fans of Mansfield Park will probably pick up on an error Emma (or the author) makes in this book. There are also a few typos, which along with the pages falling out, let the author and the publisher down. I think the title is a bit lame too, but I do understand that authors of Jane Austen fan fiction need to have a strong reference either to Jane Austen or one of her major novels in order to capitalise on their market. I’ve had my ups and downs with Jane Austen fan fiction, but would recommend Jane Austen Ruined My life to other fans of this genre.